This weekend holds the most unique Santa experience we have in Southern California. Your children have a chance to fish with Santa! 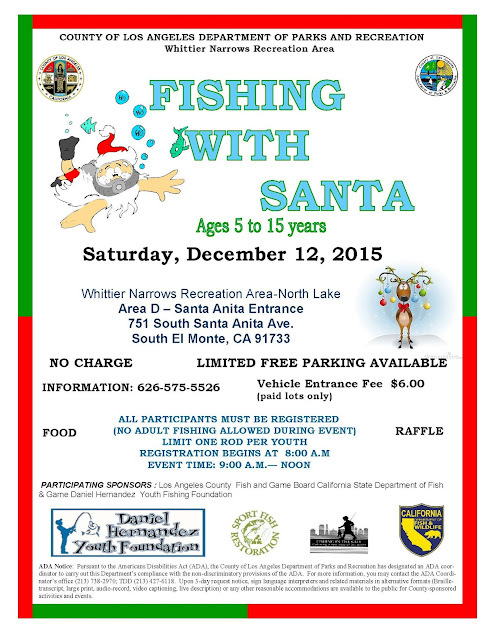 Every year, Whittier Narrows Recreation Area hosts a FREE Fishing With Santa Event. My kids look forward to catching dinner and spending time with their friends. Santa is the cherry on top. This provides a great opportunity to get your family photo for your Christmas Cards, it's not too late. You don't know how to fish? Don't worry, there are many volunteers and older kids walking around helping bait hooks and remove fish. Wait, you don't have fishing rods or bait? No worries! Rods are on loan with unlimited bait for all participants(as long as supplies last). BONUS: Every participant has a chance to win their own fishing rods in the FREE raffle after lunch.